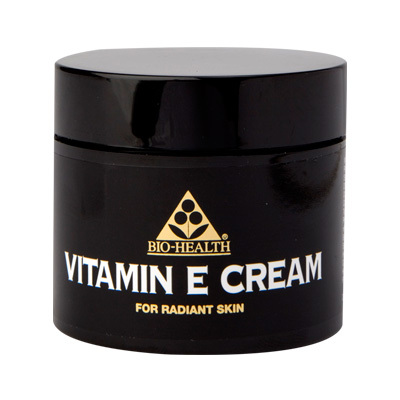 Vitamin E Cream from Bio-Health. Lanolin free. No animal testing. A light fragrant preparation just as suitable for daily moisturising or as light night cream. It is an all-purpose salve for any beauty programme including stretched skin and chapped hands. Your face needs constant protection to keep it looking healthy, radiant and young. That’s why you need a moisturiser that rehydrates and conditions the skin, whilst giving protection against the sun, wind and the effects of ageing. Vitamin E is well known for its ability to promote healthy, vibrant skin. It is a powerful anti-oxidant that is thought to help slow the ageing process of skin, reducing fine lines and wrinkles guarding against damage from smoke and other pollutants. The healing properties of vitamin E also allows the cream to gently soothe and repair sun burnt or wind chapped skin, reduce itchiness and protect against the effects of exposure to the elements and is lanolin free. Can be used as after shave cream and also comes as a body lotion. This is a great all day cream, my husband also uses it as an aftershave cream, highly recommend !! This is the best EVER cream, for myself and my husband , best value for money !